If you’re looking for the best NCLEX books to prepare you for the NCLEX-RN or NCLEX-PN exam in 2017 you’ve come to the right place. We’ve compiled a list of the top 8 NCLEX prep books and study guides for you. Take a look below and find out which prep material is best for you, so you can tackle the NCLEX and never look back. 1. Content Review: These books focus on refreshing and re-teaching you to all the nursing information you’ve forgotten over the years. Each NCLEX topic is retaught in great detail. The more familiar you are with the exam material, the better you’ll score. 2. Strategy Review: Strategy books don’t re-hash everything you’ve learned in the past and instead teach how to best answer NCLEX styled questions. You’ll learn more about the different types of questions, how to prioritize answers, and dive deeper into learning techniques to eliminate answer choices. 3. Q&A Review: Books with lots and lots of practice questions. You’ve heard the phrase, ‘Practice makes perfect’ and that’s exactly what these books are geared for. How you choose a book depends on; how well you’ve retained your nursing education, how much time and effort you want to put into studying, and how long it’s been since you’ve graduated. Saunders’ most popular and top rated prep book is the best NCLEX book in the market today. 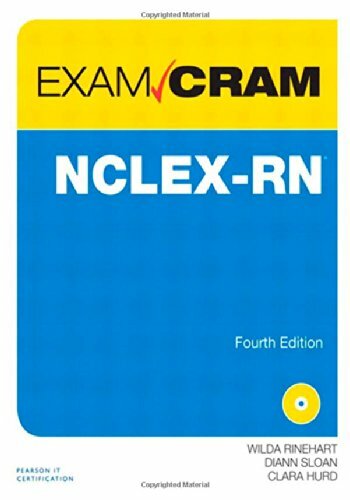 For those interested, a NCLEX-PN version is also available. Author, Linda Anne Silvestri, Ph.D & MSN has done a tremendous job in building a 1,184 page book with over 5,100 practice questions to prepare you for the exam. Take comfort in knowing that Linda is a Nursing Instructor at Salve Regina University in Rhode Island and that she’s an expert on the topic. The book is clearly organized into 20 units with 77 chapters in total. There’s detailed review of all the relevant NCLEX content areas found on the test. Each chapter includes multiple choice questions and alternate item review questions for practice. And once you complete the book, there’s a comprehensive test covering all the subject areas to ensure you understand all the material. Each practice question you encounter is accompanied by a detailed answer and explanation – we were never left scratching our heads at any time. Additionally, you’ll find test taking tips and strategies on mastering specific question types which we found helpful. The new version of the book also includes access to an Online Evolve Account, which offers additional study resources from anywhere you can sign on. To conclude, Saunders’ comprehensive review is just that. A comprehensive NCLEX review that does an excellent job at preparing exam takers to pass with flying colors. Kaplan’s one of the biggest test prep names out there. And for good reason – most of their prep material is rich and well written. Kaplan’s NCLEX-RN Premier is one of those quality prep books. Kaplan’s a firm believer that test taking can best be handled when you know the ins and outs of the test and its techniques. On that end, there’s plenty of both tips and strategies for taking the NCLEX and computer adaptive tests. It should be noted that this test prep isn’t the strongest of review books. We found Saunders Comprehensive Book to be much better for those needing a review of the substantive areas of the test. But Kaplan’s strength lies comes from its unique testing strategies designed towards tackling nursing questions. The book includes a full paper practice test that comes with an answer key and detailed explanations for all the problems. There’s a second, practice test online available too. Kaplan also threw in a few extras: DVD video tutorials, mobile study resources, a guide for becoming licensed, tips for re-taking the test after failing, and a guide for international nursing. When looking at the whole package, Kaplan offers a fantastic book that excels at mastering NCLEX testing strategies. It’s a great match and complement to the Saunders Comprehensive Review. And for those that feel comfortable with the NCLEX material, this may be sufficient alone for your prep needs. Did you know about a fifth of the NCLEX exam is dedicated to testing skills in the area of prioritization and management of care? This is exactly where LaCharity’s Prioritization, Delegation, and Assignment focuses in on. LaCharity is one of the most popular and best NCLEX book publishers. Their resources on prioritization, delegation, supervision, and patient assignment are second to none. In fact, this is the only review book in the market that focuses on these key topics well. The prep book provides focused content review, case studies, and challenging practice questions throughout. There’s a three tier organizational structure to the material which progresses from; building foundational skills, to applying skills learned, to extending into patient/health scenario examples. Detailed answers are provided for all questions so you can learn from mistakes made. On that note, we found that the questions are in line with what to expect on the official NCLEX. For those looking for a quick refresher of the NCLEX exam topics, the NCLEX-RN Content Review Guide is a perfect match. Kaplan has combined all the important and relevant NCLEX content areas into one book. While you won’t find in-depth coverage on specific exam material, you’ll find information on the most frequently tested material found on the NCLEX-RN exam. In our review, we found the information covered to be comprehensive enough to do well. The book has been updated for 2016 and is now in its, fourth edition – the material has been updated and it’s now in line with the latest NCLEX requirements. There’s a lot of information to be found here and it’s a best seller on Amazon for good reason. If you’re looking to re-hash your knowledge this a strong pick. Just understand, this isn’t a practice book. Lippincott’s Q&A Review for NCLEX-RN follows the school of thought that practice is king when it comes to test preparation. 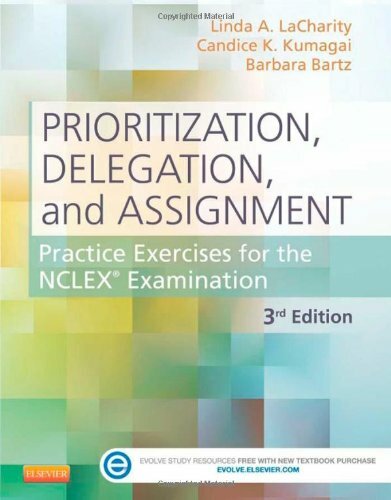 Authored by professors from the Indiana University of Nursing, this book has been developed to reinforce NCLEX material through the drilling of practice questions and answers. There are 1,180 pages in the book and 6,500 questions and answers to look through. This is a giant among NCLEX practice guides. The included CD, contains 1,300 of the guide’s total 6,500 problems – and is arranged so that you’re able to take questions in a study format or review mode. A nice touch depending on your needs. If the six thousand plus questions aren’t enough you can also purchase the Lippincott NCLEX-RN 10,000– which is an online program that generates personalized, adaptive NCLEX quizzes designed to boost your skill level and knowledge. Even more extra practice. The book’s logical organization makes focusing on areas of weaknesses easy and the rationales behind problems are written exceptionally. We also liked that Lippincott added some color to the pages – if you’re going to be reading hundreds of questions daily, making the material more pleasant to look at is going the extra mile. Lippincott’s Q&A is simply an extraordinary tool to get you prepped and ready for the NCLEX. If you’re looking for practice NCLEX questions to work on, look no further. This is an excellent companion to Saunders Comprehensive Review. 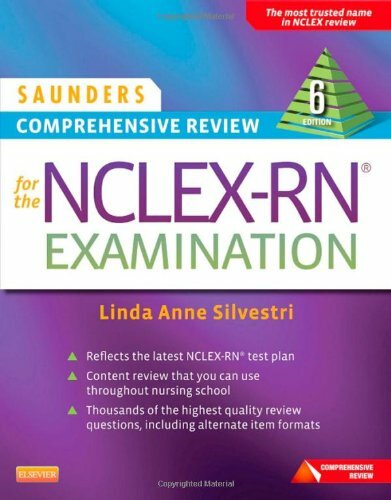 The focus in the Saunders Q&A Review book is less on material review and more on test taking strategies and NCLEX question drilling. Practice can be the difference between a passing and failing score, and you’ll find plenty of practice here. In fact, there are more than 5,600 test questions covering all the different NCLEX question types. Included is an additional online pre-test which allows you to identify your weakness areas before starting to study. Having a starting benchmark is really helpful when it comes to arranging a study schedule and plan. There are detailed explanations for all the practice problems, ensuring that you understand why the right answer is correct. That said, we found that the Saunders Q&A Review isn’t quite as comprehensive or recent as Lippincott’s Q&A. But, this is still a fantastic tool to consider especially if you can find it for a great price. We all know we’re not to supposed to cram for exams. Overloading your brain with information doesn’t make the material stick. And drawing blanks on your exam day is no way to perform. But Exam Cram is a unique book. Author’s Wilda Rinehart and Diann Sloan wrote one of the best NCLEX books when it comes to focusing on efficient test studying and preparation. And when we say efficient, we mean it! Exam Cram targets precisely the content areas of the NCLEX that you need to know the most. The 545 practice questions, practice exams, core concept hot-lists, and other aids are all finely tuned to reflect on the most important exam material that you need to know. True to its name we feel that this is the best NCLEX prep book for last minute brush-ups. The book’s material is very well laid out and the presentation makes for cramming the complex information all the more possible. Although we don’t recommend it! In fact, you should probably use Exam Cram as a longer term study tool. Sadly, everyone won’t dedicate the right amount of time to studying. So if you’re one of those people that find yourself short on time, this is the best book we can recommend to get you ready. Davis’s Drug Guide for Nurses is one of the most comprehensive resources geared for drug identification and understanding. The newly published 15th edition delivers all the information you need to know about administering medications safely. We’ve added it on our list, as it’s one of the best ways to learn or relearn information about the drugs that may appear on the NCLEX exam. And it’s useful after the exam too! You’ll find hundreds of well-organized monographs for both generic and trade name drugs. And as a bonus, you’ll gain a one year subscription to DrugGuide.com – giving you online access to over 1,100 monographs. What makes this book stand out? Well, we really liked that it not only contains bare bones information about drugs like their pathways and contraindications but there are sections that focus on nursing focus, interventions and teaching- which can be immensely helpful for any nurse. Mosby’s Memory Notecards are an excellent study aid for visual learners struggling to master pharmacology. Many students swear by the book’s unique pictorial flashcard style. The mnemonics are humorous and the little pictures and sayings help make remembering even the most complex concepts easier. The material is sorted into categories and contains both generic and brand name drugs. The thick pages and spiral bound format make this makes this highly portable. Great to use when killing time or traveling.